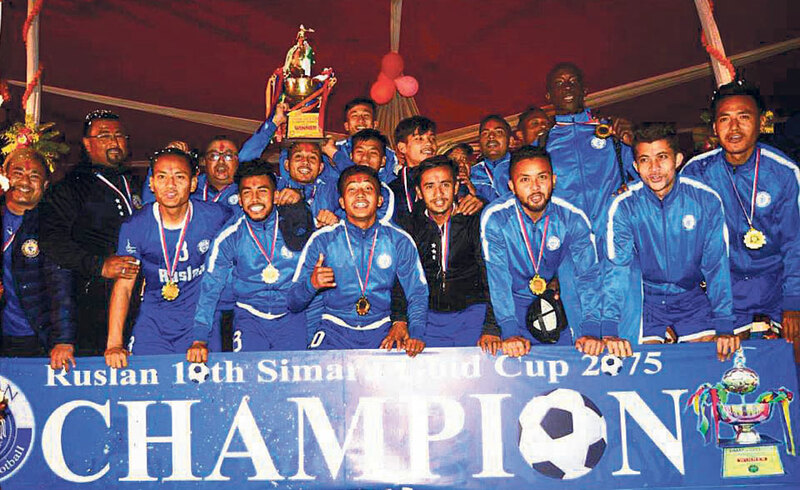 BARA, Jan 27: Three Star Club has lifted the tenth Simara Gold Cup Football Tournament defeating the defending champion departmental team Tribhuvan Army Club 5-4 on sudden-death in Simara on Saturday. At the final match played at the Simara Stadium, Three Star defeated Army to become the champion of the tournament for the first time. Ranjan Bista scored the winner in the sudden-death to seal the title for Three Star. Bista scored the decisive penalty after Army’s Suman Aryal’s spot kick was saved by Three Star keeper Alan Neupane. Earlier, Three Star’s Fode Fofana and Sushil Rai scored in the sudden-death, while Dinesh Rajbanshi’s shot was saved by Army keeper Bikesh Kuthu. Likewise, Bikesh Tamang and Bikash Khawas scored for the departmental team, while Neupane saved Dipak Gurung’s penalty. Earlier, the match was pushed into the tie-breaker when the regulation time ended in a goalless draw. In the tie-breaker, captain Bikram Lama, Ananta Tamang, Rupesh KC and Ranjit Dhimal converted Three Star’s kicks, while Kuthu saved Sunil Bal’s effort. Likewise, for Army, skipper Bharat Khawas, Dip Lama, Bibek Basnet and Santosh Tamang scored, while Kuthu could not score against his counterpart Neupane. With the title win, Three Star took home a cash prize of Rs 600,000, and the runner-up Army was prized with Rs 300,000. In the individual awards, Three Star’s Sushil Rai was named the best player of the tournament and was given a Yamaha Seluto bike. Alan Neupane, Adama Doumbia and Megh Raj KC were adjudged the best goalkeeper, the best defender and the best coach respectively. Army won the remaining categories as Santosh Tamang and Tanka Basnet were named the best midfielder and the best forward respectively. They all bagged Rs 20,000 each. Nawa Janjagriti Yuwa Club’s Nikesh Thapa was declared the rising talent and was awarded with a cash prize of Rs 15,000.